Caribbean GeoTextiles' woven fabrics are strong, woven UV resistant GeoTextile fabrics constructed made to provide Hurricane Storm Protection reinforcement over soft soils. Its superior attributes make it ideal for use in the construction of dikes and sludge caps. High seam strengths add to the ability of our GeoTextile products to remain exposed in the environment for longer periods of time than conventional fabrics .Environmental irrigation and flood control, river bank Sediment soil stabilization, soil conservation, Shoreline coastal beaches erosion control, These high-strength woven polypropylene geotextiles (HSWG) provide incredible tensile strengths, have a rip-resistant weave that minimizes damage due to vandalism or mechanical damage and have unique reinforced selvages to permit significantly higher sewn seam efficiencies. To assist with your Hurricane Storm Protection Bahamas, Exumas, Belize or Caribbean, colored marker yarns are strategically placed parallel to the fabric edge as a reference mark for overlapping adjacent panels. 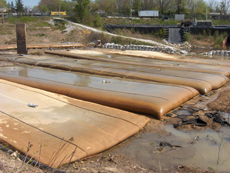 Our GeoTextile products are manufactured in an environmentally pleasing sand color to help blend it to the environment and offer the highest UV protection available. Contact SDMI dba Caribbean GeoTextiles today to learn how these GeoTextile products can help you save money on your next Caribbean project at 706-654-0062.